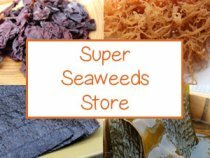 Seaweed is not actually a "weed" but a kind of sea vegetable that grows in nutrient dense ocean waters along rocky shorelines all over the planet. As one of the most nutritionally dense foods in the plant kingdom, they are an abundant source of minerals and beneficial polysaccharides. Clean ocean waters are a nutrient-rich treasure chest and sea plants thrive in them pulling in high concentrations through their wide leafy blades. They are particularly known for their large amounts of bioavailable minerals, including iodine, iron, calcium and others, essential nutrients for proper brain function, metabolism and maintaining healthy bones. They are a powerful source of electrolytes as well as blood purifying chlorophyll and polysaccharides, which encourage the natural detoxification of heavy metals and other toxic substances. Many of these sea vegetables help to improve digestion, decrease LDL cholesterol, increase bone density, lower blood pressure and have been shown helpful for reducing excess body weight. Sea plants, also sometimes referred to as marine algae, are generally classified into three different groups: red algae, green algae and brown algae. Different varieties are found in nearly every seaside ocean environment around the world, but the species may vary depending on the location and temperature of the waters in which they proliferate. All sea vegetables require photosynthesis in order to develop and mature. This means they must attach themselves to rocks typically found along coastlines and tide pool regions, floating close to the waters surface in order to receive adequate sunlight. They are multi-cellular marine plants that maintain rigid cell walls and do not have roots like land plants do. Instead, their entire structure acts like a feeding vessel, drawing in high concentrations of food through blade-like leaves. This enables the entire plant to take in large amounts of nutrients that are especially abundant in clean cold ocean waters. As mentioned, the sea plant's unique design allows for a concentrated amount of minerals, fertilized by the waters in which they grow. Much of our cultivated plant-based foods today are often lacking in mineral quality and sea vegetables can be a great whole food supplement helpful for amending possible dietary deficiencies. Eaten periodically, they are one of the best natural sources of dietary iodine and contain many other phytonutrients, vitamins and polysaccharide-rich long chain sugars. It only takes small amounts of either dried whole or ground sea vegetables added to soups, meals or blended into drinks to provide a daily dose of potent nourishment. Seaweeds, used on a periodic basis, are an essential component to most therapeutic health regimens. Not only do they offer bio-available nutritional elements, but they additionally help to balance body pH, protect against radiation as well as certain types of cancer. Seaweeds have been consumed by coastal marine-based civilizations all over the world since the dawn of human existence. In their dried state they could be preserved for long periods of time, providing a storehouse of vital nutrition that was light weight and easy to transport. 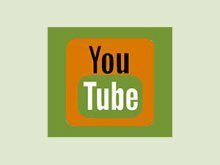 They have been used extensively throughout history as natural fertilizers for land based food crops to increase production and nutritive content. Asian cultures are typically known for their use and consumption of many types of seaweed varieties, like nori, hijiki or kombu, commonly prepared in Japanese cuisine with two of the most well-known examples being sushi and miso soup. Sea vegetables became especially popular in the Western world with the macrobiotic health movement, popularized by Japanese teacher George Ohsawa in the 1960's. 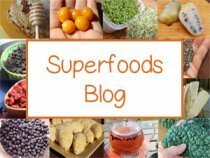 The macrobiotic diet and philosophy places an emphasis on using sea vegetables with cooked whole grains and beans to improve their digestibility. While seawater contains a wealth of minerals and phytonutrients beneficial to health, it can also be contaminated from human created substances, like petroleum residues, radioactive isotopes, sewage waste, pesticides and herbicides as well as heavy metals. It is therefore particularly important that the seaweeds we consume, not only come from pristine ocean waters that are less likely to be expose to these toxic substances, but also seaweeds that undergo testing through independent inspection to monitor potential impurities and/or have taking measures to offer organic certification. It is best to avoid most seaweeds cultivated off of the coast of Japan, due to the higher potential of radioactive contaminants from the 2011 Fukushima disaster. Most higher quality wild seaweeds available today often come from the colder and nutrient-rich waters found in the upper Northern Hemisphere. 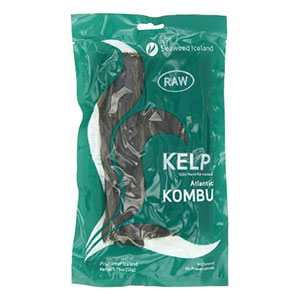 Kelp is a general term used to describe a broad range of over 300 species of brown marine algae that grow wild in shallow coastal regions all over the world. The specific varieties we are referring to in this category have larger fronds and grow most predominantly in the Northern Hemisphere. These distinct types range in length, nutrient profiles and taste qualities. 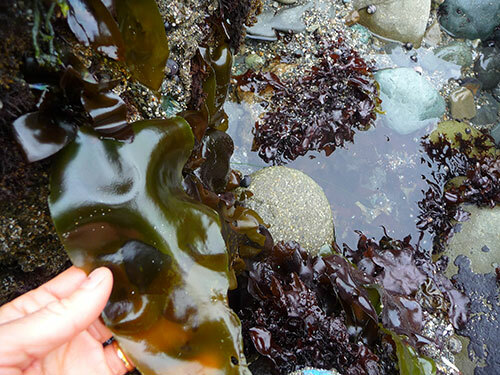 Although kelp sometimes goes by the name "Laminaria", not all kelp comes from this genus. 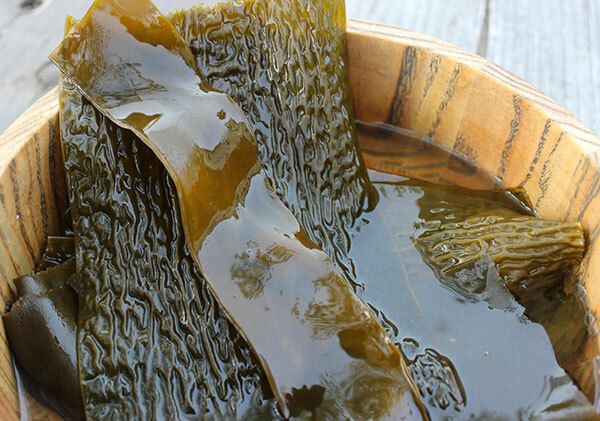 Both kombu and wakame are common names for several species of kelp most widely known. 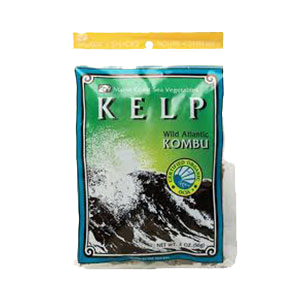 Kelp seaweeds are nutritionally valued for their high mineral content, particularly iodine. They are a rich source of alginic acid (algin), fucoidan, laminarin and the carotenoid pigment fucoxanthin, substances known for their detoxifying, immune boosting and chemoprotective compounds. Dried whole pieces or powders can be simmered in soups, stews or added to grains or beans. 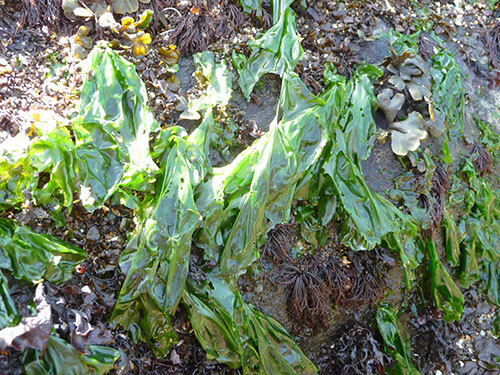 Nori, also called laver, grows off of coastal rocks in thin twisted formations that are not usually more than a foot long. 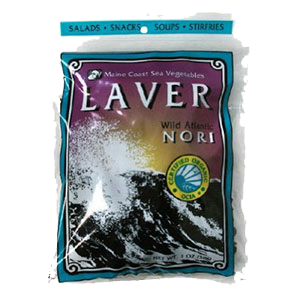 Although it is available as whole laver pieces and flakes, it has been traditionally prepared in Asian cultures for centuries in the form of "sheets", using a process similar to Japanese paper-making. 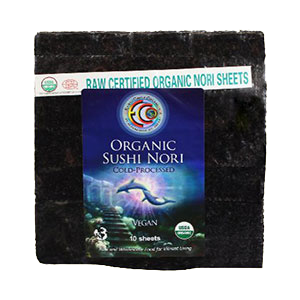 Nori sheets are used in sushi, of course, but are also great to use as wraps to replace tortillas or bread. 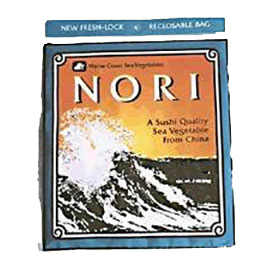 The most nutritious nori is the raw variety, which is usually a dark green color. Bright green nori sheets have been toasted and are lower in nutrient content. 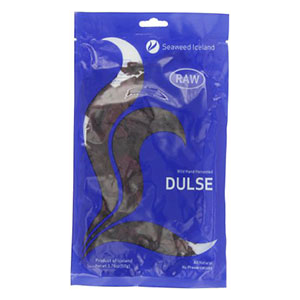 Dulse is a red seaweed variety that is frequently found on the Northwest Pacific and North Atlantic coasts, Iceland, Canada and regions of Ireland and Scotland. When it is dried is has a soft, chewy texture and delicious smoky flavor. Like nori, it doesn't require cooking, and can be enjoyed as pieces or flakes sprinkled over meals as a salt replacement. Whole pieces can be soaked briefly, as the blades are fairly thin, and chopped into salads. 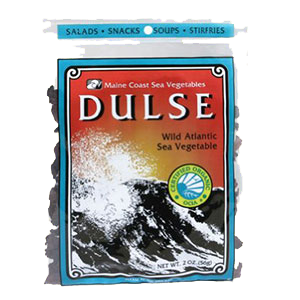 Dulse and nori are both great tasting seaweeds for those who don't prefer stronger flavored variations. 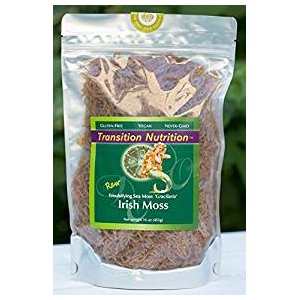 Irish moss is not actually a "moss" but a type of seaweed that has been used for centuries in Ireland (hence the name) as a healing sea vegetable prepared in soups to fortify and especially strengthen malnourished individuals. 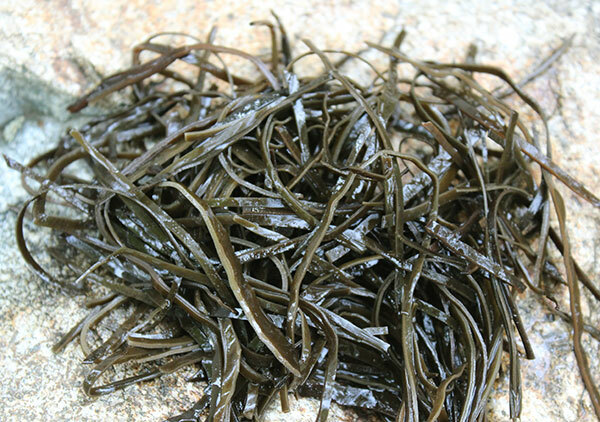 It is a very mucilaginous seaweed that you wouldn't normally eat like other varieties. 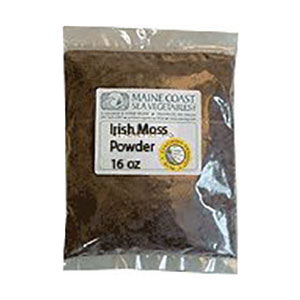 It is traditionally brewed as a broth to release its beneficial nutrients or can also be soaked and blended as irish moss gel and added to various foods and drinks as a nutritive thickening agent. It is a natural source of the polysaccharide carrageenan, which is different from carrageenan extract used extensively in the food industry as a gelling medium. Bladderwrack is one of the most popular sea vegetables growing along the British Isles and has been used in that region of the world for centuries. 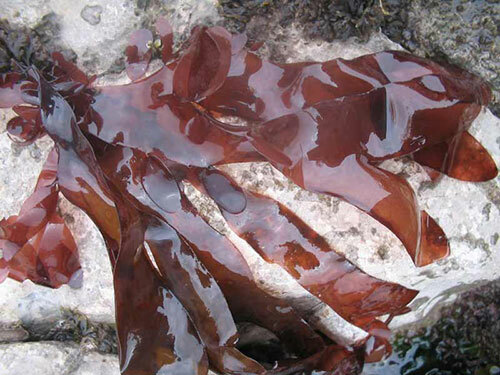 This brown sea plant is the #1 superfood as far as iodine and polysaccharide content. When fresh, it is very mucilaginous and quite slimy. For this reason, it is often dried, powdered and consumed in capsule form as a supplement to one's diet. 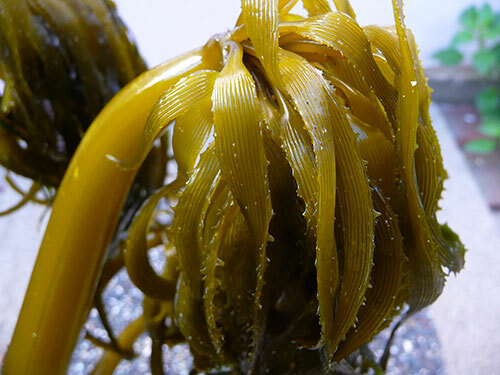 Bladderwrack also contains significant amounts of beta-carotene, algin, zeaxanthin and many other minerals. The powder can also be added to soup broths for added thickness, but it tends to have a stronger taste that is not as palatable flavor wise. Sea palm, another species of kelp, grows on the Western coast of North America and parts of Canada. It is one of the only sea plants that can survive growing out of the water. As the name implies, it looks like a miniature palm tree and can be easily identified for this reason. Sea palm grows clumped together in erect stands usually above the water's surface. In fact, it is one of the few sea vegetables that can remain upright when out of water, a result of its thick hollow stem. The leafy fronds are sold in their whole dried state, which is quite crunchy and can frequently be eaten straight as a snack food. Hijiki and arame grow in coastal regions of Japan, China and Korea. It is therefore important that you purchase tested sources that are contaminant free and grown in non-polluted ocean waters. 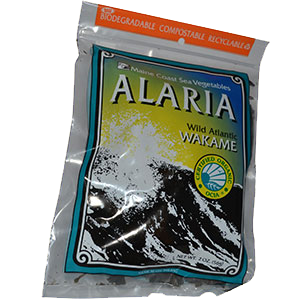 Most commercial arame and hijiki is harvested from the Ise Bay Peninsula, which is about 295 miles or 476 km south of Fukushima, so it is best to get tested sources if you use it on a frequent basis. Both hijiki and arame can be soaked before adding to foods or stewed in soup where it usually doubles in size. Because they are long and stringy, rather than wide and leafy, they make a great addition to a seaweed salad or raw zucchini pasta dishes. 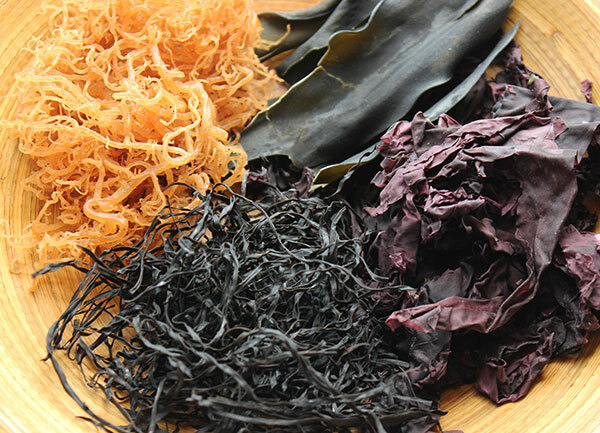 Seaweeds contain beneficial nutritive elements like polysaccharides, iodine, other minerals and trace minerals and are a source of natural sodium. Iodine is an especially important mineral needed for healthy thyroid function and hormone production. Seaweeds are whole food bioavailable sources of iodine that can help protect the thyroid gland and its primary role in regulating metabolism. 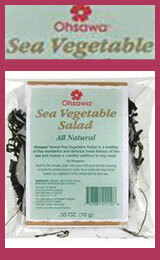 Most high quality seaweeds contain 20 times more vitamins and minerals that land vegetables. Mineral content varies from type to type but in general most are very high in iron, calcium, magnesium, manganese, selenium, bromine, vanadium and sodium. Vitamins found in larger amounts include folate, beta-carotene, riboflavin, vitamin K, pantothenic acid, vitamin C, niacin and choline. They are also significant sources of dietary fiber as well as protein and small amounts of omega-3 fatty acids. Polysaccharides are long chain sugars, also abundant in medicinal mushrooms, and are one of the healthiest food substances we can ingest. All sea vegetables contain their own array of polysaccharides but are commonly found in the form of algin, fucoidan, carrageenan, agarose and beta glucans. These dietary glyconutrients are helpful for building immune health, nourishing the skin, soothing inflammation, detoxifying the body and providing a long burning fuel source. Some types of seaweed contain a polysaccharide and natural fiber called alginate or algin. Algin is a viscous fiber found predominantly in brown algae. 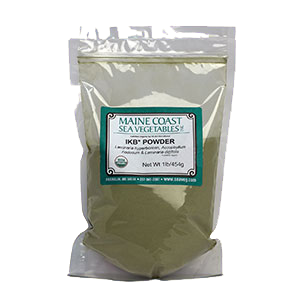 It is high in mucilaginous compounds that help to chelate heavy metals, absorb toxins from the digestive tract and eliminate them from the body. In one study using a alginate-pectin combination results showed that a "reduction in toxic heavy metals" was achieved without side-effects. The long chain sugars guluronate and mannuronate found in algin are thought to be effective for helping to reduce body fat and control obesity. 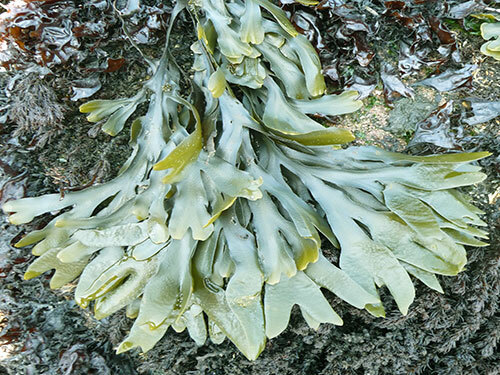 Algin is chiefly found in brown algae seaweeds like kelp, bladderwrack and wakame. It is prized for its ability to expand, absorbing water quickly, and has been found useful as a natural appetite suppressant to increase feelings of fullness. In addition, alginate has been shown to slow down the fat digesting enzyme lipase, thereby reducing the amount of fat the body can digest and store as excess weight. Beta glucans, or ß-glucans, are known as "biological response modifiers" because of their ability to successfully activate and boost the immune system. Some scientific evidence supports ß-glucans effects on normalizing blood cholesterol concentrations and these polysaccharides are additionally being studied for their potential antitumor properties. Fucoidan polysaccharides contain sulfur molecules and are also referred to as a sulfated polysaccharide. Recent research indicates their ability to reduce pain and blood clot formation by blocking pro-inflammatory enzymes and prostaglandins. Fucoidan's are found primarily in brown algae's and also contain antiviral and immune boosting attributes. Agar or called agar agar is commonly found in red algaes from the polysaccharide agarose and has benefits to digestion as a mild laxative with properties as a gelling agent. These characteristics are released in water when it reaches a boiling temperature. 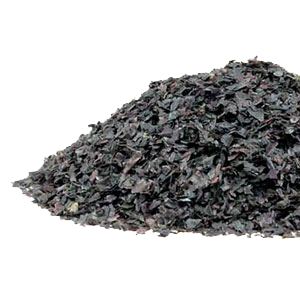 Carrageenan, also from the red algaes, is a most well known component of the sea vegetable irish moss, although it is present in other seaweeds in lesser amounts. 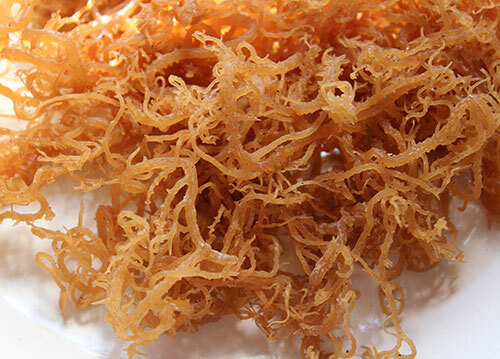 Irish moss gel, composed mostly of carrageenan, is used as a thickener and stabilizer in certain foods and desserts. 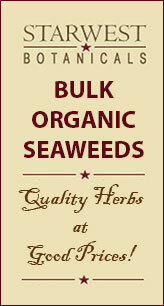 You can harvest our own sea vegetables in clean coastal waters where they are available. They are most prolific with new grow in the late spring and early summer season. It is important to make sure to gather seaweeds in pristine ocean environments away from potential industrial contaminants. Also, due to radioactive pollutants in some coastal regions it good to get them tested from areas that you frequently harvest. Seek the advice of your medical physician before consuming iodine-rich seaweeds, like kelp or bladderwrack, if you have had a pre-existing thyroid disease or are currently diagnosed with a thyroid condition. Avoid iodine supplements and seaweed products if you are sensitive to excessive intake or have severe allergies to fish or seafoods. Consult your healthcare advisor if pregnant, nursing, have a serious medical condition or are taking prescription medications.